To mark National Glaucoma Awareness Week 2018 (12-18th June), InView Opticians is promoting the importance of regular eye examinations in detecting Glaucoma as early as possible – a leading cause of blindness affecting 2% of the UK population today. Glaucoma is a group of eye diseases that affect the optic nerve, which connects the eye to the brain. Damage to the optic nerve can affect sight, usually due to a build-up of pressure within the eye. According to the National Institute of Health and Care Excellence, 10% of blindness registrations in the UK can be attributed to glaucoma. 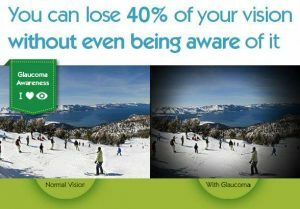 The challenge with glaucoma is that it presents with very few symptoms, if any, until it is advanced in most cases. In the advanced cases, nerve damage at the back of the eye is likely to have taken place, which will lead to progressive sight loss unless controlled. With early diagnosis, most patients benefit from retaining their vision. Eye examinations are a great way of detecting and monitoring glaucoma. Your internal eye pressure level is a key indicator of glaucoma in most cases, and all optometrists will measure your eye pressure routinely. Most patients are familiar with this test as the ‘machine that puffs air at your eye’ – technically referred to as non-contact tonometry. The benefit of having regular eye examinations is that your optometrist can observe any variations or patterns in your eye pressure, making it easy to detect glaucoma as early as possible. You are at increased risk of developing the most common form of glaucoma (primary open angle glaucoma) if you are of black-African or black-Caribbean origin, or if you have a family history of glaucoma. The National Health Service (NHS) encourages people aged over 40 years old with a known immediate family history of glaucoma to have regular eye examinations – InView Opticians will provide you a FREE NHS eye examination if you are over 40 years old and have immediate family history of Glaucoma. A visual field test is performed to monitor progressive nerve damage associated with glaucoma. You will be shown a sequence of light spots and asked which ones you can see. Some dots will appear in your peripheral vision, which is where glaucoma begins. If you can't see the spots in your peripheral vision, it may indicate the glaucoma has damaged your vision. At InView Opticians, we will always perform a visual fields test as part of our comprehensive eye examination routinely, especially if you are considered to be at risk of glaucoma. If you’ve read this far, it should be quite obvious that an eye examination is not just about finding out whether you need glasses or a stronger prescription for your vision. Glaucoma checks are routine in eye examinations in the UK. Sight loss caused by glaucoma can be prevented or controlled in most cases if diagnosed early, which requires regular visits to your optician, normally every 12 to 24 months. The space between visits required for glaucoma monitoring will be suggested by your optometrist depending on your individual risk factors. To find out if you are eligible for a FREE NHS eye examination or to book today, register online or ring 020 8907 3454. Fashion your own look this summer with 50% off discount until 31st May 2018. Just landed at InView Opticians is their latest collection of branded sunglasses in a wide range of shapes and styles. The Harrow based independent Optician prides itself for its unique summer eyewear. Sharing her top pick for this summer, dispensing assistant Shriti Gadhia said “Each year we individually select each of our sunglass frames based on the latest trends. This year, one to look out for is the Cubik Sports frame which is extremely flexible and crack resistant, with a wrap round design and the Brown and Red Mirror tint makes it a stylish change from the usual”. To celebrate the launch of their 2018 summer eyewear collection, the practice at, 15 Belmont Circle, Harrow is offering 50% off any sunglasses in the month of May 2018. Sunglasses are an excellent way of protecting our eyes from harmful UVA and UVB rays contained in sunlight from entering our eyes. Prolonged exposure to sunlight can contribute to a number of eye diseases, in particular cataracts, macula degeneration and ptyregium. “All our sunglasses have an inbuilt UV tint to stop the most harmful rays and can be made to any prescription” added Shriti. Bring in your prescription to order your sunglasses, or to book an eye examination today, register online or ring 020 8907 3454.